You need to know about industrial Ethernet cabling.The environment of the industrial site is worse than that of ordinary environment, at least in vibration, humidity and temperature. Therefore, industrial Ethernet requires more professional knowledge and practical experience. 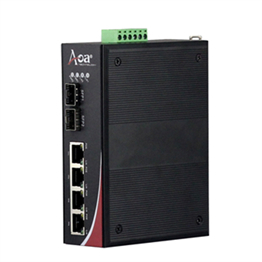 If you are installing or using an industrial Ethernet switch, it is important to understand the five elements of cabling, signal quality, ground loops, switches, and communications that can cause problems and increase maintenance costs. As with all networks, the pros and cons of a cable have a direct impact on the pros and cons of industrial Ethernet.In addition to high electromagnetic interference (EMI), industrial environments often have a certain level of temperature, dust, humidity and other factors that are not common in home and office environments. So, how to choose the cable?In the office, business-grade cables, such as class 5 cables, are better suited for 10MB networks and class 5e cables for 100MB networks.According to the ANSI/ tia-1005 standard, 6 types of cables or better cables can be used for host or device connections in industrial environments. 6 types of cables can achieve 1GB network within 100 meters and 10GB network within 55 meters.Class 6e cable can achieve 10GB network within 100 meters. Compared with class 5 cables and class 5e cables, class 6 cables are less susceptible to crosstalk and external EMI noise. Industrial Ethernet cables are designed to resist the physical erosion of cables in even more severe industrial environments.When installing class 6 cables, ensure that the RJ45 interface and socket can also reach class 6.The best way to do this is to use pre-made plug-in cables for short-distance wiring and to install connectors in the plant.Use sockets for long distance wiring.